Do you say shrimp or shrimps? Madame Editor says it’s shrimp. But I like shrimps. Even my husband says shrimps (he has an accent, so he can get away with it). After a heated debate via text message, which involved an alarming number of shrimp emoji’s and red angry faces, I waved my white flag to the Editor. Shrimp singular it is. Earlier this week, I whined about my busted fridge and if you’re just joining us, I have made it my personal mission to let nothing go to waste. Amidst all of the chaos, two impromptu recipes were born out of my unfortunate kitchen malfunction. 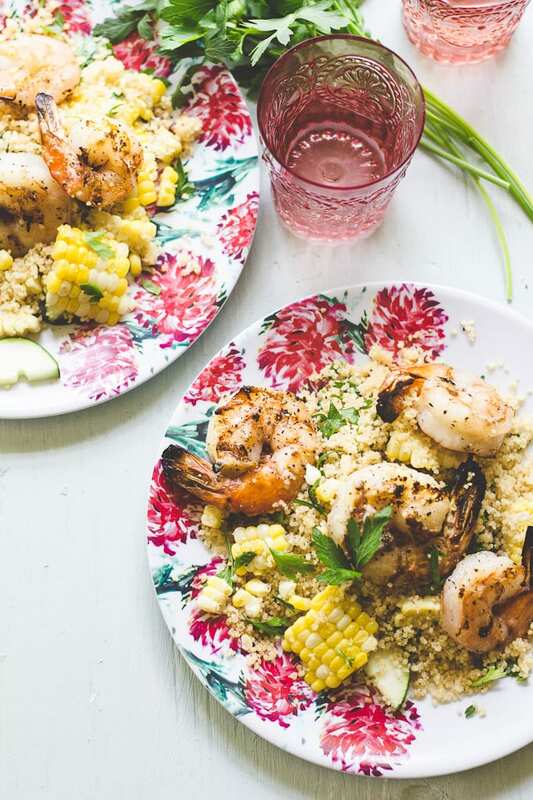 My summer crunch salad came first, and now this festive ensemble of garlicky grilled shrimp. 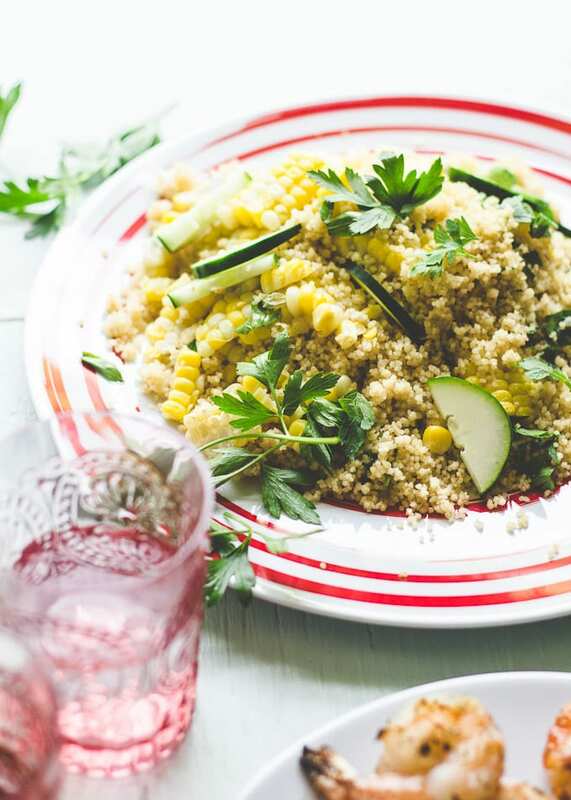 You get a free salad with that: whole wheat couscous, sweet corn, cucumbers, and lots of fresh lemon and olive oil. These jumbo shrimp (ah, shrimpsss!) were buried in my freezer and somehow survived the epic meltdown. Shrimp scampi was about to happen. However, the roof guy was coming over to give us a quote (yes, my life is falling apart) and I wasn’t in the mood for a seafood scented kitchen. I relocated this project to my outdoor grill. A quick marinade of garlic and white wine was made for the shrimp to soak, while I prepared the beginnings of a couscous salad. I came up with a neat little trick for that too- I boil a big pot of water for my corn, and instead of discarding the water, I use it to flavor my couscous. Just mix the two together and let it sit. In about 5 minutes, you will have gorgeous fluffy couscous. Flavorful and functional. We waste no time over here. To serve, I made a mad dash for the prettiest plates that I could find before my feline friends attacked my lunch. Pink and red flowers make everything better, don’t you think? The flavors of charred shrimp, buttery garlic, and sweet corn was an unexpected treat. That roof guy definitely missed out. PS- Eva, if you are reading this, the day you stop sending me product samples I will die. Enjoy friends! To save on time, you can purchase shrimp already cleaned and deveined. Because the couscous salad needs time to chill, make sure to start that first before you grill the shrimp. If you’re curious about what kind of white wine to you will need, use what’s good enough to drink! I like a dry sauvignon blanc or pinot grigio. This shrimp sounds so good! I love garlic anything and grilled shrimp tastes so good! Pinning and Stumbling! Even that salad looks delicious and tempting! Oh Goodness, it’s only a little past 7 am here on the west coast but I want shrimp for breakfast!!! Your photos are absolutely gorgeous and I think I recognize those glasses (aren’t they the best?) ;-). 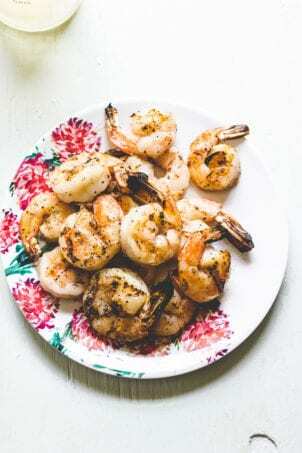 Grilled shrimp are my absolute favorite, these look fab! You’re such a multi-tasker Emilie! I love everything about this recipe…everything! OMG this shrimp is seriously perfection! Another nice recipe. Thanks so much. Could you do a salad like this with quinoa instead of couscous? I made this and it was DELISH! Do you think this could be made with salmon?